Providence, the capital of Rhode Island, has emerged in recent years as a foodie capital. It has all the right ingredients for a group itinerary that will have tour members drooling. Old-line Italian restaurants and classic American diners, along with cutting-edge, contemporary eateries orchestrated by young, creative chefs, flavor Providence’s culinary landscape. Kristen Adamo, vice president of marketing of the Providence Warwick CVB, credits the city’s culinary rise to several factors, including its dynamic ethnic mix. The French, Italians, Hispanics and Portuguese have all put their stamp on food traditions in this historic New England melting pot of cultures. Anyone with hunger pangs can’t go wrong in heading to Federal Hill, the Little Italy neighborhood on Providence’s West Side. Atwells Avenue, the main drag, boasts 40-some restaurants—many of them Italian—plus Italian food shops. A street divider strip in the colors of Italy’s flag—red, white and green—runs down Atwells. Outdoor tables crowd the sidewalks in summer. 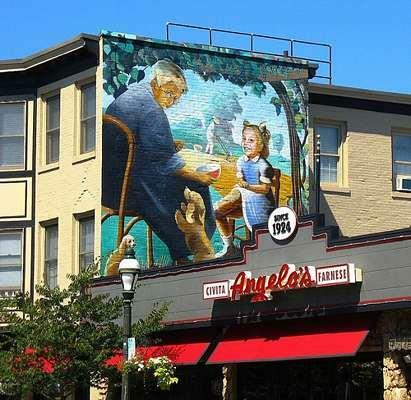 Angelo’s Civita Farnese, a standby since 1924, serves Italian classics in a homey atmosphere. The main dining room is decorated with vintage, black-and-white family photos and a painting of Venice. An electric train, activated by anyone who puts in a quarter, circles overhead. Guy Fieri of the Food Network’s Diners, Drive-Ins and Dives filmed at Angelo’s last year and helped prepare the house pasta sauce and oven-baked, twice-cooked meatballs. (They sell “Guy Ate Here” T-shirts, with Guy’s picture, for $15.) Other signature dishes include the braciole (rolled, hand-cut flank steak flavored with spices and sauce, served over egg noodle pasta), pork chops baked in marinara sauce and the super-tender stewed veal in a tomato/green pepper sauce. Try the creamy limoncello cake for dessert. Like most full-service Federal Hill restaurants, Angelo’s can accommodate groups. Kerri Furtado, tourism sales manager of the Providence Warwick CVB, includes many Federal Hill restaurants and businesses in her group itineraries. One of the most popular options is a cooking demonstration with five-course meal at Geppetto’s, located on Depasquale Square, a hopping outdoor dining venue on summer nights. Groups (18-60) may request a chef presentation in the “Secrets of Grilled Pizza,” “Perfect Pink Vodka Sauce” and “Marsala Made Simple.” The meal ($23.95 per person) consists of salad, calamari, pink vodka sauce over penne, assorted grilled pizzas and tiramisu for dessert, plus non-alcoholic beverages. Other Geppetto’s options include a meal with a hands-on class in pizza making and an Iron Chef-style cooking challenge with the group divided into teams. Other Italian favorites in Federal Hill include Andino’s, Camille’s, Joe Marzilli’s Old Canteen, Blue Grotto and Mediterraneano. (Fieri’s TV show filmed last year at the latter and featured the spaghetti in white clam sauce.) A few blocks away on Broadway, Spirito’s occupies a huge white Victorian that once served as a funeral home. 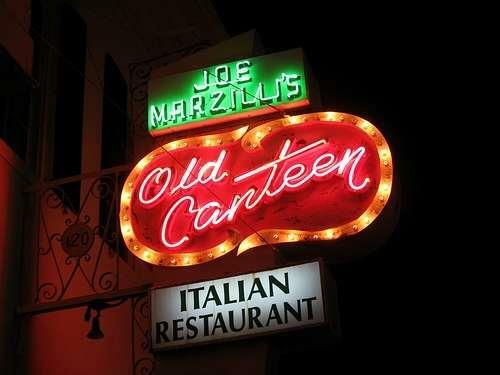 It’s been the home of the local Italian-American club since the early 1900s. Demonstrations in cannoli filling, sauce making and preserving can be arranged. A group dinner with three wines ($39.95 pp) features a choice of entrees—chicken Parmigiana or baked Rhode Island cod with a traditional Ritz cracker topping. A highlight of any Federal Hill visit is a tour with demonstration at Scialo Bakery, where all the products are made from scratch in brick ovens that date back to the 1920s. Luigi Scialo, an immigrant from Italy’s Pomigliano d’Arco province, started the business with his brother in 1916 and ran it with the help of family until his death in 1993 at the age of 103. Today his daughters carry on the tradition. You’ll get plenty of free samples and freshly brewed coffee but may want to buy some goodies for the road, perhaps a chocolate eclair, cream cheese brownie, mini-bundt cake, cupcake or cookie. Everything at Tony’s Colonial Food Store is imported from Italy. It makes a good shopping stop, if only to peruse the Italian candies, biscottis, cheeses, pastas, olives, oils and vinegars, mustards and grains. They even have chestnut jam. Or pop into Venda’s, another food shop, and see the ladies making ravioli. The Culinary Arts Museum at Johnson & Wales University’s Harborside campus interprets the evolution of food preparation and belongs on any tour of Providence. Groups can schedule a lunch at the museum’s restored actual 1926 diner, which operated in Providence as the Ever Ready until 1989. 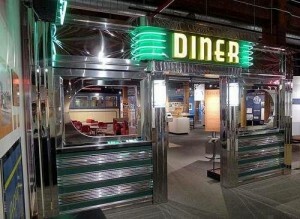 Guests may be seated at one of the diner’s 15 stools or at tables adjacent to the restored eatery, which is part of Diners: Still Cookin’ in the 21st Century, the only permanent exhibition dedicated to this American institution. Providence is considered the birthplace of the diner. Other nostalgic exhibits spotlight early road, rail, air and ocean liner travel, with menus, uniforms, china and cutlery to tell the story. Dinner at the White House showcases a collection of hand-written and signed food-related documents from U.S. presidents, first ladies and White House chefs, plus photographs, menus and china. Visitors also will see antique stoves, kitchen gadgets and other artifacts that trace America’s gastronomic history. Wedding cakes and other stunning showpieces created by culinary students and instructors are displayed as well. 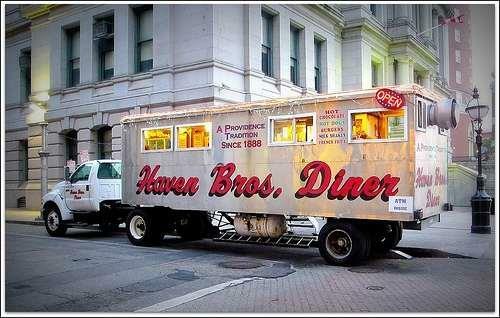 For a real diner experience in downtown Providence, check out Haven Brothers Diner, which parks next to City Hall every night at 4:30 p.m. and stays open until 3 or 4 a.m. The counter wraps around the end of the trailer, but there are only three stools, so many patrons eat their burgers, hot dogs, fries and shakes outside. The current trailer dates from 1949, but Haven Brothers opened in 1888 as a horse-drawn lunch wagon and has been at this location since 1893.) The Haven family sold the business in 1953, and Savero Giusti has operated the diner since 1986. The only time it was outside Providence was for an appearance on the Today show in New York in 2008. The Triple Murder Burger was featured on the Travel Channel’s Man vs. Food show starring Adam Richman. For a fun dining experience in Warwick, try the Iron Works Tavern, an upscale restaurant located in the original main office building of the Rhode Island Malleable Iron Works factory. Original beams, bricks and high ceilings recall its industrial beginnings. Hearty signature entrees range from Pork Osso Bucco and Boneless Beef Short Ribs to Bacon Infused Meatloaf and Duck Wellington. The tavern’s macaroni and cheese is available with toppings like shrimp, lobster and bacon. Also irresistible are the grilled pizzas. It’s hard to decide between the mac and cheese, pulled pork and chicken pesto. The Iron Works Tavern is located next to the Hilton Garden Inn. Warwick is home to several other group-friendly hotels, all close to T.F. Green Airport.